Do you like History? Do you want to enjoy it in a unique and exciting way? Then YOU should be part of our awesome group! Created more than 40 years ago, our distinguished organization has brought the soldier of the Revolution to life at battle reenactments, historic sites and special events throughout the East Coast and beyond. One of the nation’s oldest and largest living history organizations, the regiment is dedicated to presenting an accurate picture of an American and British unit that actually fought in our War of Independence…and to have a great time doing it. In addition, we are recognized by the Internal Revenue Service as a non-profit educational organization. That means that all your expenses connected with the regiment are tax deductible! EXPERIENCE the life of the Revolutionary War soldier. 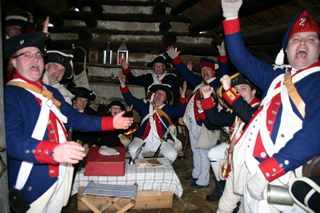 You’ll get the feel of the past as you participate with authentic equipment and flintlock muskets in battle reenactments filled with thundering volleys, swirling smoke, fife and drum calls and the special excitement only possible in this unique pastime. On other occasions you’ll bring the past to life for the public as the regiment appears at historic sites throughout the region. For those interested, the unit’s tents and gear are available for camping in the 18th Century manner at many events. And, you may also have the opportunity to be part of television and motion picture projects, too. Interested in military fife and drum music? Intrigued by serving on an 18th Century field gun crew? We offer those possibilities as well, along with an important role for women as campfollowers in our authentic camp. LEARN the maneuvers and manual of arms of the British and American fighting men and discover just what all that strange equipment was for. Your knowledge and appreciation of this dynamic period in America’s past will expand as you visit museums and historic sites with us. Do you have any skills or knowledge you’d like to share? Let us know. Much of our success has been due to the many talented people who have joined us. GAIN new friendships with a great group of people and bring an exceptional new dimension to your life that few others get to enjoy! Our members come from all walks of life: teachers, high school and college students, historians, businessmen, law enforcement officers, medical professionals, musicians, craftsmen, technology experts and more. They all share your interest in America’s heritage. JOINING IS EASY. Simply download an application and mail it to our recruit coordinator with a check for your dues. You will be contacted by one of our members who will help you get started and who will send you all the information you need to be “fit for service.” We maintain a supply of surplus equipment, so we can outfit you almost immediately while you begin to get your kit together. That way you will be able to get in the ranks with us and enjoy your membership right away. Step away from the television. Here is History you can touch, savor and be part of! There is nothing else like it! To submit a request for more information, use the online contact link above, Or.....just email: Corporal Chip Cash Or....call him at: 609-791-9542. NEW VIDEO: See the Regiment in Action!